Against the backdrop of Kauffman Legacy Park, Kansas City artist Maria Ogedengbe has created Missouri GOURDen, a magical community garden at 48th and Troost, in which she shares the simple beauty and creative potential of gourds. 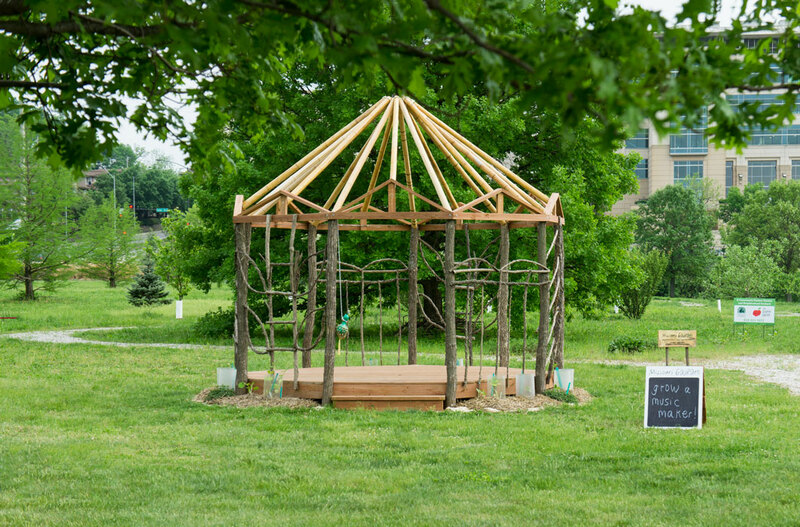 A collaboration between Ogedengbe and Kansas City Community Gardens, this interactive space dedicated to gardening, education, music, performance and art is designed to both inspire artists and bring the community together. At the heart of Missouri GOURDen is a bentwood garden house which Ogedengbe designed to serve as a framework for the emerging gourd plants. 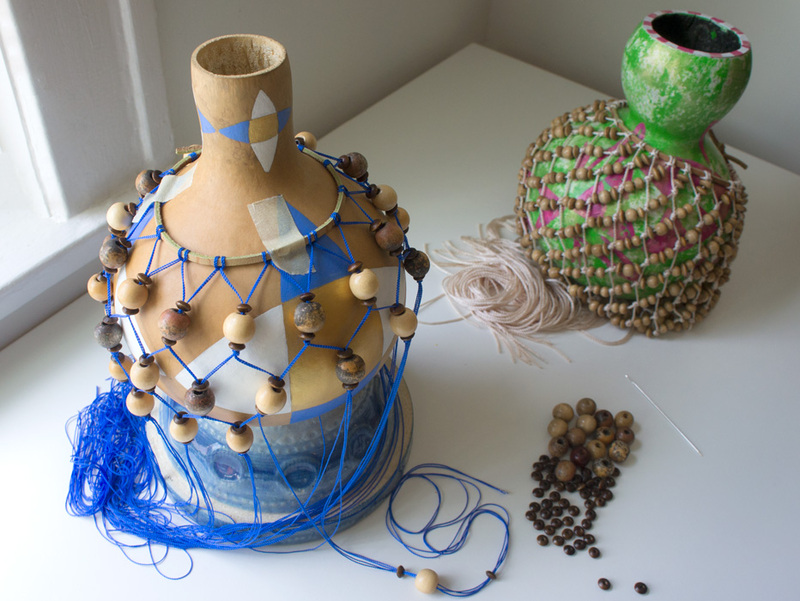 The creation of this nine-sided “GOURDzebo” was supported by an ArtsKC grant, along with individual and corporate donations. Visible year round, the charming garden house flourishes through the summer and fall. From May through September, gourd vines climb and envelop the structure’s trellised walls and roof, formed from honeysuckle vines. Teeming with white, night-blooming flowers and fruits, the vines host a biosphere of visitors including grasshoppers, butterflies, dragonflies and hummingbirds, that find the garden irresistible. Ogedengbe launched plans for the garden, now in its second season, in 2015. The project’s initial inspiration was rooted in her fascination with the shekere, a percussion instrument made from gourds. Shekeres are crafted by lacing beads and other decorations around the frame of dried Lagenaria siceraria gourds — the variety specifically cultivated in Ogedengbe’s GOURDen. Native to Africa, the Lagenaria siceraria, also known as the bottle or hardshell gourd, has inspired civilization’s imagination since it was first cultivated over 10,000 years ago — and artists exploring all mediums have discovered its aesthetic possibilities. Resembling a soft wood, but without the grain, the dried fruits have been sculpted, painted, carved and crafted into objects both useful and decorative. For thousands of years, the gourds have also inspired musical instrument designs. Numerous stringed instruments, including predecessors to the banjo and harp, originated in Latin America; Southeast Asian musicians developed gourd-based reed wind instruments, and in Africa, the shekere was invented. Though the project will involve the public in crafting shekere-style instruments, Ogedengbe’s vision for the garden went far beyond the shekere. “I saw Missouri GOURDen as a peace-fostering project where people from diverse neighborhoods could come and participate in gardening, get to know one another over the summer, and then are no longer strangers,” she says. Ogedengbe, who holds a Master of Fine Arts from Yale University’s School of Art, has focused much of her work in textiles, which she has exhibited at galleries around the city and abroad. GOURDen was her first foray into a garden-themed project. From the extensive research through installation, she conceived and planned each element of the garden. In addition to the September performance, the public is invited to garden each Saturday morning through September, grow their own music makers and make new friends. A seasonal space, “Missouri GOURDen” will be open daily through mid- to late September at 48th and Troost by the Discovery Center. Saturday morning group garden hours are from 8:30 to 10. For more information (347) 687-5247 or www.missouri-gourden.tumblr.com.